The family of Alfie Evans have been left heartbroken after gifts left at a memorial tree were stolen - according to supporters of the toddler. Posting images of the tree near Alder Hey Children's Hospital, a member of the Alfie's Army Facebook group condemned the "extremely disrespectful act" and appealed for the tributes to be replenished. "We admin are sorry to say we have been made aware of people stealing gifts left for Alfie at his memorial tree." "Army members left various gifts for our beautiful fighter and this breaks not only our hearts, but Alfie's families hearts that some people have done this extremely disrespectful act," they said. Alfie died at the Liverpool hospital on April 28 after a long legal battle over his life support treatment. 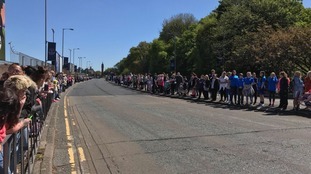 Several hundred well-wishers lined the street outside Everton FC's stadium to say farewell to 23-month old Alfie Evans. The funeral of Alfie Evans is taking place in Liverpool later today. He died shortly before what would have been his second birthday after being treated for a degenerative brain disease. He'll be laid to rest in a private ceremony later. His parents have thanked the community for their support but are asking for privacy during the funeral. A private funeral for 23-month-old Alfie Evans will be held next week, it has been announced. Supporters of Alfie Evans have organised a vigil to “brighten up the world” on what would have been his second birthday. Family and friends along with members of ‘Alfie’s Army’ plan to light a candle to remember the 23 month old who was at the centre of a legal battle over his life support. The vigil will be held in Springfield Park, next to Alder Hey Children's Hospital where Alfie died. Alfie had suffered from an undiagnosed brain condition. His parents had wanted to take him abroad to Italy for further treatment - but doctors said further treatment was futile and his life support was withdrawn last month. The father of Alfie Evans has said he dreamt his son could follow in the footsteps of Everton star Wayne Rooney at an event with the club. "We'd like to pass on our sincere thoughts and condolences to Tom, Kate and their families for their sad loss following the death of their son Alfie Evans. "We also pass our thoughts to those at the hospital who supported the family in caring for Alfie. May Alfie rest peacefully." "My gladiator...gained his wings," says the father of Alfie Evans following the death of his son. The little boy was at the centre of a legal battle over his treatment that touched hearts around the world. An MEP is launching a campaign for "Alfie's Law" to give parents of terminally-ill children more say in end-of-life hospital care. The father of Alfie Evans says his son has now survived for 3 days without ventilation. The 23 month old's life support was withdrawn on Monday. As I sit by Alfie's bedside, every second of every day, it encourages me more and more that Alfie will live. Alfie lives comfortably, happily, without ventilation. That must be enough for you now to consider that Alfie may prove you wrong. Lawyers representing Alder Hey Hospital bosses said the fact that he had continued to breathe unaided might have surprised members of the public but had not surprised specialists.